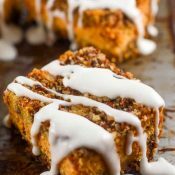 These sweet Pumpkin Pecan Cheesecake Bars with a crunchy Gingersnap crust, a layer of creamy pumpkin cheesecake, and a crumbly pecan topping drizzled in a sweet vanilla glaze make this a fantastic fall dessert. Previously, in my Pumpkin Praline Bread Pudding post, I wrote about my quest to make a yummy yet easy pumpkin dessert that Mr. Flavor Mosaic would love since he is not a lover of regular pumpkin pie. Each year I try to make a new pumpkin recipe. 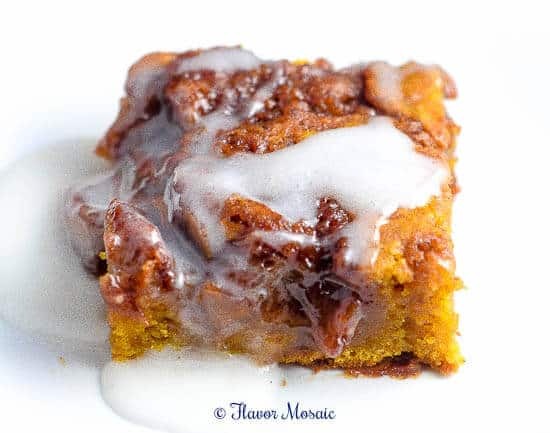 Last year I made the Cinnamon Swirl Pumpkin Coffee Cake, which was a hit. This year I decided to make Pumpkin Cheesecake Bars but I wanted mine to have a gingersnap crust and a crumbly pecan topping with a sweet vanilla glaze. These Pumpkin Pecan Cheesecake Bars were a hit with everyone, even Mr. Pumpkin Pie Hater AKA Mr. Flavor Mosaic loved them. These would make a wonderful dessert for Thanksgiving or for a fall potluck dessert. If you want to use a graham cracker crust, you can substitute 1-1/2 cups graham cracker crumbs. For whom will you make these Pumpkin Pecan Cheesecake Bars? Spray an 8x8 pan with cooking spray or grease it with butter and flour. Gingersnap Crust: In a large bowl add the crushed gingersnap cookies. Add in sugar. Pour in the melted butter. Stir until combined. Pressed the gingersnap crumb mixture into the bottom of the 8x8 baking pan. Set aside. Pumpkin Cheesecake Filling: In a large bowl or stand mixer, mix the cream cheese and sugar together until creamy. Then add one egg at a time, mixing in between. Then mix in the pumpkin and pumpkin pie spice. Pour the mixer over the gingersnap crust in the baking pan. Crumbly Pecan Topping: Sprinkle half a box of yellow cake mix evenly over the cheesecake mixture. Then sprinkle chopped pecans evenly over the top of that. 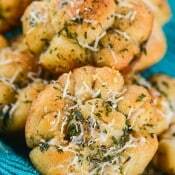 Bake in a preheated oven for about 50 to 60 minutes or until the top is golden brown and the center is not wobbly. Cool in the pan for about an hour. Then refrigerate for at least 3 hours or overnight. Glaze: While the cheesecake bars are cooling, make the glaze. In a medium bowl add the powdered sugar. Add the vanilla. Pour in the heavy cream and stir. You may need to add a little more cream to get the right consistency. 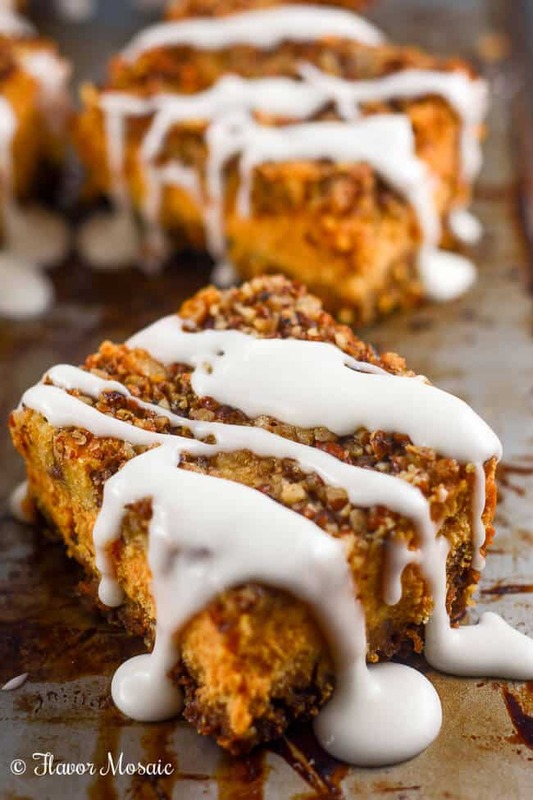 Drizzle the glaze over the chilled pumpkin cheesecake bars and serve. 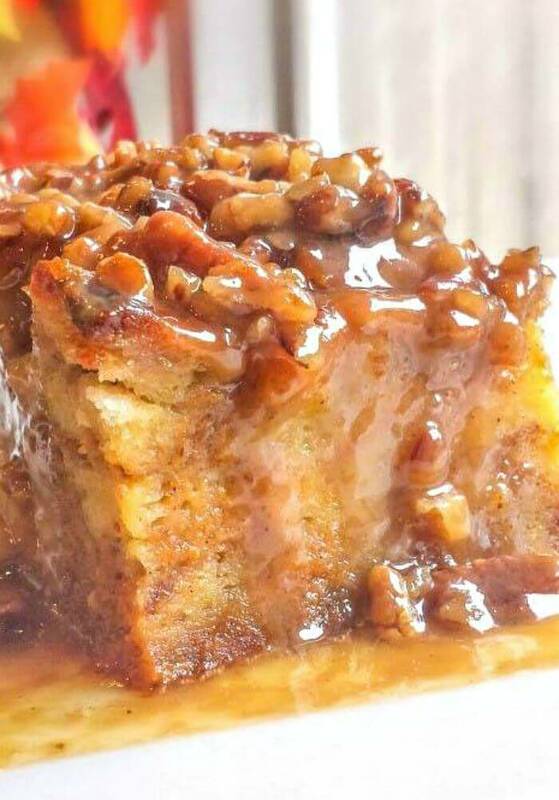 If you like this recipe, be sure to try my Pumpkin Praline Bread Pudding. 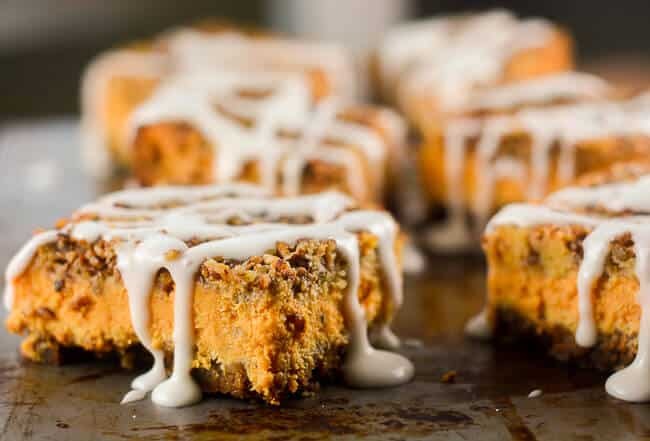 Or you may prefer this Cinnamon Swirl Pumpkin Coffee Cake. 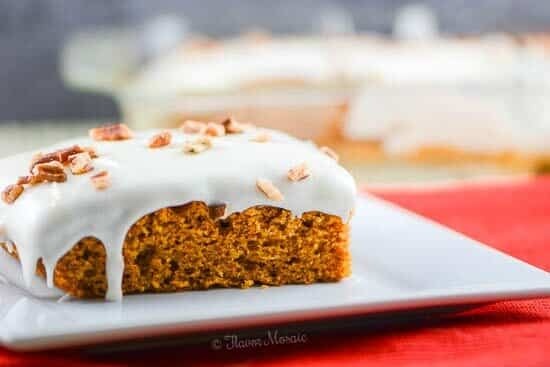 Or you may like my Pumpkin Sheet Cake with Cream Cheese Frosting. This is everything I want in a Fall dessert.